Wow, I have a feeling I will be working in the studio all day today - there's snow outside! It's beautiful and it's not really cold, my dog's water wasn't even frozen. They are. however, begging to come back in the warm studio. 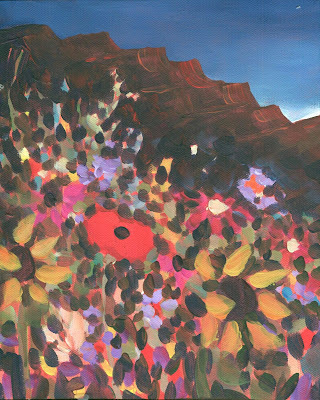 This painting is a bit of a departure - it has a dark night sky, a mountain ridge, and lots of beautiful flowers in the canyon below. I should finish it tonight. Enjoy your Saturday!